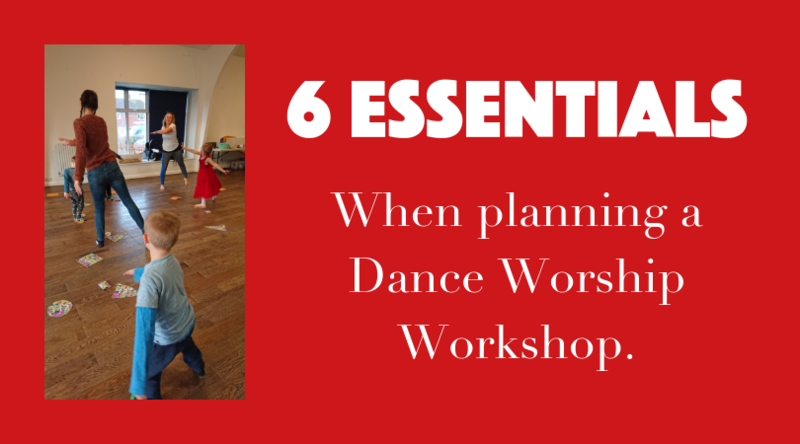 Planning is essential in all forms of delivery, whether that is for dance or something different. Throughout nearly 20 years of teaching, I have tried many ways to layout a dance workshop or session, today you get to hear the layout I find most useful! It might be that you want to create a whole session or just one exercise or series of movements, whatever it is, it is still the same process. We’ll talk in terms of a ‘session’ but the same applies to an exercise/ series of movements. This post is all with reference to leading a Christian based dance worship workshop of some form. However, all that is shared can be applied in a normal secular context without faith. Who will be your age or population focus? What is the number of participants that will be at the workshop, or what are your maximum numbers? Each one of the above can impact the workshop in different ways, so take the time to make it specific to what you are wanting to achieve. So what 6 essential things should I include? Whether you know the participants well, or they are completely new faces, you can never start a session cold. An ice breaker allows participants the opportunity to begin the session recognising that they are in safe space, that their ‘ability’ won’t be questioned, and that they feel welcomed to see where the workshop will take them. This initial opening/ ice breaker will set the tone for the rest of the workshop, participants will either be hooked and want to go further or may feel unsure about continuing. Therefore this ‘hook in’ needs to grab their focus, allow participants to tune in with others and get ready to learn what is coming. How has your week been? Can you use one word to describe your week? What brought you to this workshop? What’s one thing that you’d love to learn in this workshop? Say your name and do an action, everyone else copy, work your way round the group. Make a freeze shape of how you are feeling about the workshop at the beginning. Imagine these 5 minutes (because that’s all it usually is) are your welcome speech, the chance to win the vote of everyone and have them wanting more. Have energy, be friendly, encourage discussion. This is so important and should NEVER be by-passed. Not only does it prepare our body, but it also ensures we are safe with our movement, our listening and helps us be our best in the session. So, what do I need to do in a warm up? Raise the heart rate – it’s important to gradually raise our heart rate and body temperature. This will decrease injuries and increase the body’s ability to move more efficiently. Create a sense of fun and involvement – look at it as a great opportunity to let them see who you are, how you teach and to get moving with you. Include dynamic stretches – these are stretches that move and encourage the body to go beyond its normal range of motion, therefore stretching and molding the muscles to work effectively. Introduce the theme – the warm up is fab place to subtly (or not) introduce your theme. Be creative and be literal, with children a game can be a great place to start. Before you rush head long into a sequence or main part of the workshop, it’s good to lay the foundation of what the session will explore and provide the chance for participants to learn specific moves which may aid them later in the workshop. In a space focus on taking 3 deep breaths, filling and emptying your lungs as much as you can. On the next set of 3 breaths, take yourself up on a rise as you breathe in, and lower as you breathe out. On the next set take a step forward as you breathe in and step back as you breathe out. Help them to feel the weight in their movement, therefore adding another dynamic to how it can be developed. Don’t overthink the exploration that you want to do. Provided you know what you want as your intended outcome, this section can be a real fun section to develop. Whilst I have called this section ‘sequence’ I recognise that not all workshops will have a sequence as such to learn. So, consider this also the ‘main bit’, the chunk that you really want everyone to grasp from the workshop. This could involve learning part of a set sequence, group work expanding a Bible verse, song verse, the theme, working with a resource, and so much more! But what you need to remember, is that whatever you did in the previous section needs to flow with ease into this one, a seamless transition, rather than a stilted connection. Up until this point, you will have mostly guided, taught or impressed on participants the best way forward with their movement. This section allows the participant to start to take some ownership over their movement style and how they want to develop. More often than not, this is where I give my participants a very loose task. I do this because I believe by this point in the workshop, they are capable of simulating movements together themselves and working with a partner or bigger group to create something that flows with the theme from the exploration section, to sequence section to this one. It’s also a great chance for me to sit back and see Gods work in progress, which is the most exciting bit of course! Just like it’s important to begin with a warm up, it’s also essential to finish with a cool down. This section has two purposes. The first, to lower heart rates and bring our bodies back to a place they are normally at, using stretches and breathing to do this. The second, to reflect on the impact of the session, to pray together or with someone individually, or take a moment of quiet. You can never underestimate the impact that a workshop will have on someone. It may not be obvious on the day, but God always moves, even when it’s not visible. As I mentioned at the beginning of this post, this outline is a process that I have found works well for me. Each of us are individual and all work differently. Take your time to find out what works for you, practise it and let God lead! Let me know what are your essentials when you’re planning a worship workshop. Want to be kept up to date with all things UC Grace? Head here. As a Christian it can be hard to remain on track, hard to remember our focus, the promises God has said, the words that our written in his heart about us. Over the past few years I have developed the 5 smooth stones concept, which has become the cornerstone of my faith, and keeps me going in those moments when life gets hard. Take a normal stone, they usually begin quite angular with sharp edges, a smooth stone is one that has been handled repeatedly, so much so, that the sharp and angular edges have worn down and what’s left is a smooth, but firm stone. Which is solid, and in most cases heavy! Imagine carrying 5 of them around, they would be quite weighty! However, they would serve as a reminder that there is something there. Something physical that you can cling to and lean on. But how is that the cornerstone of my faith? Phil 2.15 – So that you may become blameless and pure, ‘children of God without fault in a warped and crooked generation.’ Then you will shine among them like stars in the sky. This is one of the key verses that I started UC Grace with, it speaks so much to me about how each of us is important and can shine a light, even in the darkest of places. 1 Corinthians 16:13 – Be on your guard; stand firm in the faith; be courageous, be strong. This is one of my most longstanding verses, it was given to me when I got baptised in 2004, and it remains framed in a poster on my stairs as a daily reminder to be firm in what I know and who I lean on. Deuteronomy 33.27 – The eternal God is your refuge, and underneath are the everlasting arms. Such a comfort verse! And a great one to visualise that God is all around us, surrounding us at those times that we feel low. Romans 8.39 – nothing will be able to separate us from the love God. Nothing, however small will get in the way of Gods love for us. 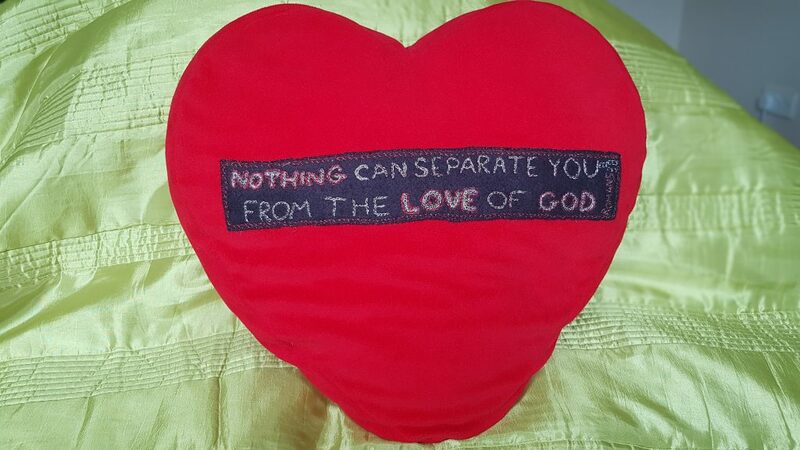 When I went away to university I was given this verse on a pillow, a daily prompt to know that God loves me. The verse (and the pillow!) has stayed with me since. Hebrews 13.6 – So we say with confidence, ‘The Lord is my helper; I will not be afraid. What can mere mortals do to me? Where ever we walk, God walks with us and he is ready to help us. Sometimes we just need to know that God will always root for us and help us regardless of circumstances. So you see, some of these verses have a long standing history that have been with me a while, others have been added to over the years. You don’t have to have 5, why not just start with a few. As long as they are engrained and you know them, they can support you through your day. I’d love to know whether you have any smooth stones, why they are important to you and how you let them support you throughout your day. Sometimes we just need to stop. Breathe. Pause. Say, ‘God I need you right now’, ‘please send more of your spirit’, ‘wrap your arms around me’. Our new Soak Nights are designed to provide just that. An opportunity in the month, at the start of week to enter into Gods presence. Although we all try daily to walk with Jesus beside us, there are always moments where life takes us down a different path, and we get to the end of a day, week, month and realise, those moments that we struggled through, were exactly the moments when God wanted to step into the breach for us. My heart for the Soak Nights is a time to actively make the decision to draw deeper with Jesus and dwell in his presence. In 2 Timothy it talks about the need to nourish and support our faith, and it’s the Holy Spirit within us that can help us do that. We can’t give out, if we are running ourselves on empty, taking the time to fill us up should be a priority. What will happen at Soak nights? We’ll spend a short time welcoming each other and doing a warm up movement activity together. As well as reading through some scriptures to focus on during the evening. This will lead into an initial time of free worship, after which there will then be a creative reflection exercise for people to part take in if they wish, leading back into free worship. There will be the opportunity to take part in some prayer movement if people wish, this will be led and guided by the Soak Night leader, depending on peoples strengths. The rest of the evening we’ll see where the Holy Spirit takes us! You can see our current dates for Soak Nights here. Do I need to have had dance experience? Absolutely not! Part of dancing and moving in your faith is the recognition that movements are tiny and big, so whatever you do, a foot tap, or hand raise, is still a movement. Want to know more and be kept up to date with other events at UC Grace? Head here to sign up. I was asked recently why I teach, and more specifically why I teach faith and dance together. Big question, that has lots of foundation, journey and hope behind it. The simple answer is I teach because I love doing it, and I use faith and dance together as I see them as one thing, intertwined together, where one can’t function without the other, so it makes sense to teach them both! Dance to me is an embodiment of your soul, your heart, your very essence. As you move and dance, more of who you are gets revealed. Often, people know that there is something greater inside them, but to tap into it, to release it… is scary, and not a journey people want to go on, on their own. Our faith helps us display who God has made us to be, the qualities and purpose he’s written on our lives, things that should be celebrated, encouraged, grown and then released. My passion… is to help each one of those things to develop, to provide a safe space for people to dig deep into who they are, fall head over heels in love with God, to lay at His cross those things that they are struggling with, to lean with their whole body weight onto God in complete trust, and feel safe and secure in the knowledge that he is for them 100%. But to do that, using the tool dance and movement. I want to share two stories that helped to lay the foundation of where I have come from with dance. I began dancing from about 4 years old, tap first, then jazz, and ballet was my last subject. I loved it, it wasn’t my passion at this point, but I chose it over sailing. From an early age I was given the opportunity to take part in Solo’s and duets at competitions… which I enjoyed… but there is one memory that sticks with me. The time when my memory failed me and I forgot my dance. I was embarrassed, upset, ashamed and so much more. It made me shrink back from performances. Who has felt that tug of the Holy Spirit, the nudge that you should do something, or that total abandonment feeling that the Holy Spirit is there right with you? Who has had that through movement? What an experience! The first time this happened, my eyes were opened to how I could share my heart with God and be lost in the process. There was no pressure to do things a certain way, or wonder about whether I was doing it right. It was just purely sinking into God in that moment to grow closer to him through dance and movement. Although, two very simple stories, they are what started my journey to where I am now. The stall in my performance when I was younger has meant that when I get the opportunity to perform now, I must lean on God in every second of the dance and breathe! Such a simple thing, but the breathing keeps me grounded, allows me to focus on breathing in God and remember the movements. There have been many times since then, that I have struggled with performances, and I know during those times it was because I wasn’t leaning on God and trying to do it by myself. Recognising the nudge from the Holy Spirit has made me more aware of my journey and conversation with God. That important thing, of both talking and then allowing time to listen back. Realising that the reasons you move, may be different to what others may see in your movement. Where you have the chance to be blessed and bless others. To look for the GRACE in that moment and seize that conversation with God. But how does this bring me to where I am now with teaching about faith and dance? I mentioned at the beginning about how I see them intertwined as one thing, as you grow in dance, you grow in God. As you grow in God, you expand you dance. The opportunity to learn and be grounded in dance technique has helped my development of dance, furthermore, the development of my dance and faith together. Allowing the Holy Spirit into this interaction, provides an avenue to dig deep in your faith and who you are. Three things have shaped how I have gone on to teach and develop my practice since these stories – Passion, purpose and freedom. To simply share. Share my love for dance, my love for Jesus and my love to encourage others. 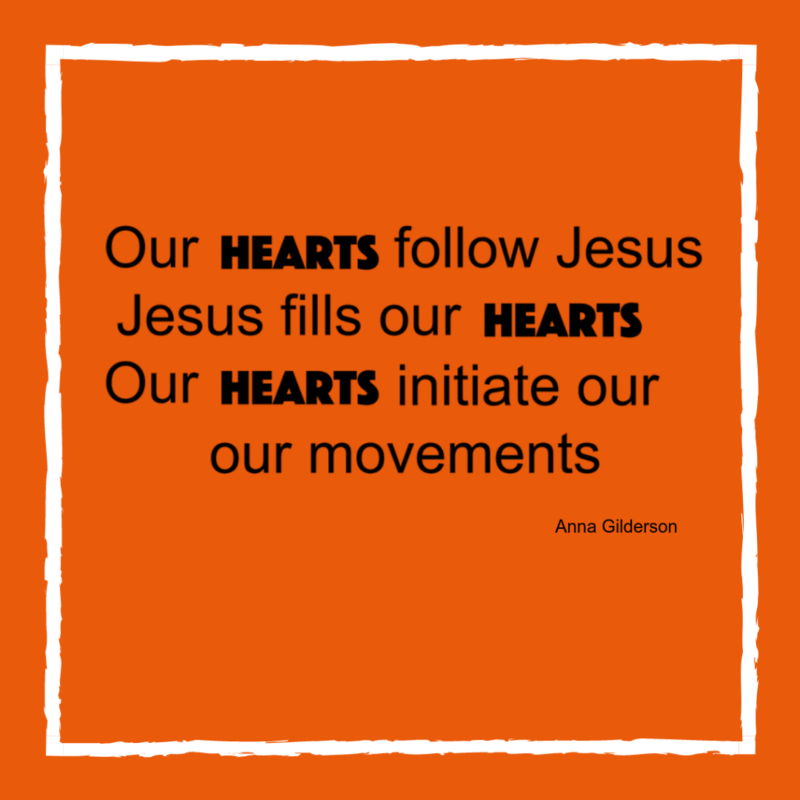 That as we move and dance our passion shines through to pass on from the youngest to the oldest the knowledge that Jesus is part of our everyday. That he carries us through those moments when we need to both receive and demonstrate grace. That breathing in Jesus is so important! Breathing him in, to every part of lives, especially when we need him most. Imparting that a solid dance foundation – the understanding of posture, balance, core and travel – are paramount in aiding us to dance and move our best for Jesus. Whilst allowing the space and possibilities of the Holy Spirit to move. ‘It is for freedom that Christ has set us free’. When words fail me, movement and dance transpose what’s on my heart. That importance of knowing that you can still have that conversation with God when words fail you, is so important. As I teach with passion and purpose, the ability to pass on the freedom in the Holy Spirit, freedom and comfort to lean on God in ALL circumstances, whether that is using the vehicle of dance or something else. There is so much to say on the subject, but that’s enough for now. I started teaching informally in 2000, nearly 20 years later I am still going, and I love just as much teaching what I’m passionate about now, as I did then. 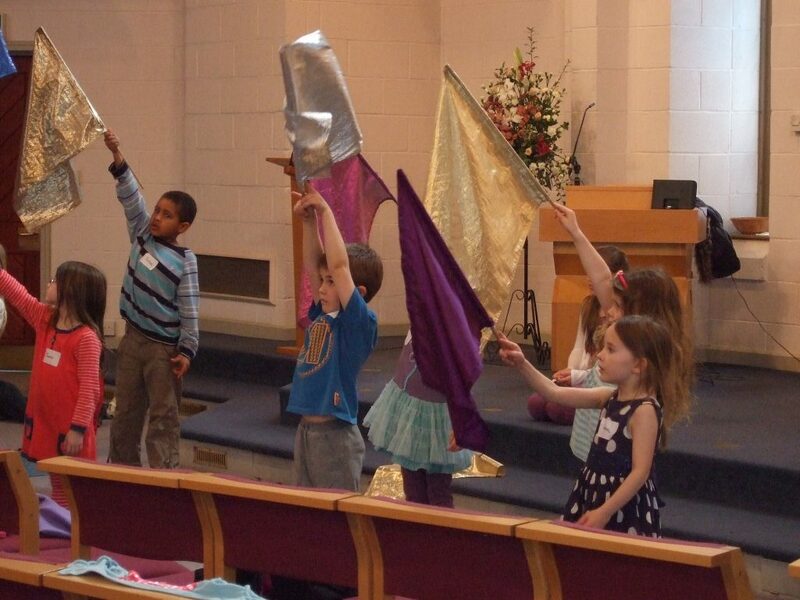 Join in me April when I run a dance training day about teaching children, dance and movement using faith. What’s your story? What got you to where you are, at the moment? Not on my mailing list? 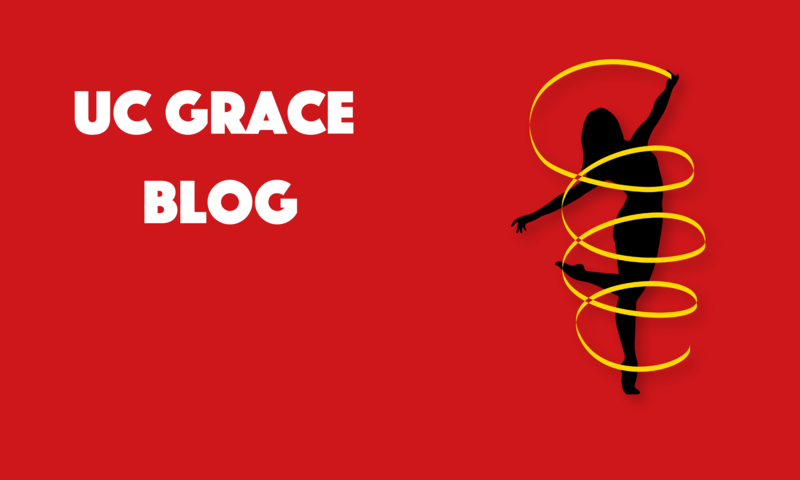 Then head here, to be kept up to date with all the latest with UC Grace. It’s been an awesome start to our events this year, with our first Living Colour morning of 2019. Such a privilege to meet with all the dancers and spend time catching up. Our focus during the workshop session was exploring Proverbs 3.1-8, by looking at 3 main sections, Gods teaching and foundation, his faithfulness and understanding when we are struggling and having help come around us. There was a great conversation about verse 1, and the different interpretations in different Bible versions. One version talked about ‘storing’ commands not keeping them, which is an image of treasuring the things that God gives you. In verses 3 and 4 we chatted about how we can forget the small things that God is faithful in, and that it’s important to remember them daily. Participants worked in pairs to pick 3 or 4 areas that they felt God was faithful in. They wrote these down on separate pieces of paper and placed them at staggered points across the space. Working with their partner they put those faithful things into a journey, what they realised as they danced and shared with others, was the importance of fellowship and being with someone as you share in your faithful journey. Below is short film of Servina and Jane’s, and Caroline and Helen’s Faithful Journey. Our next Living Colour is planned for Saturday 22nd June, you can check out the info here. But why not join us before that at one of our dance days. 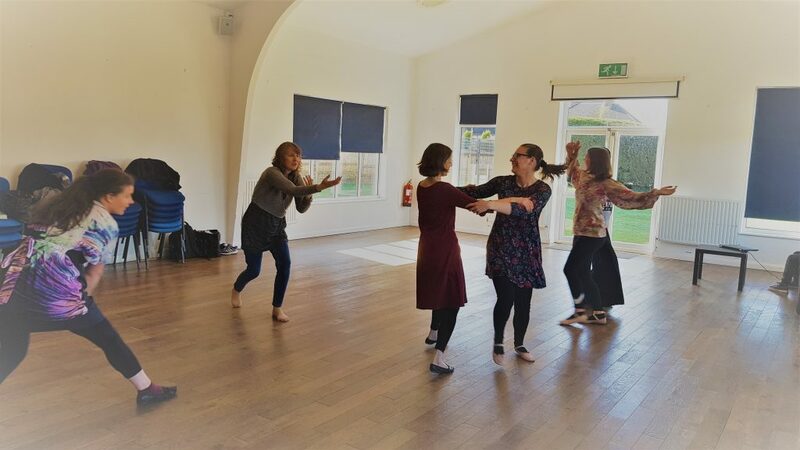 Teaching Children | Dance and movement – 13th April. Not on our mailing list? Then make sure you head here, to be kept up to date with all the latest with UC Grace. Last night I had the privilege of being invited to be part of the Candlemas service at St Micahel’s, Aldershot, it was such a lovely evening, I left buzzing and I want to share some of what God spoke to me during the service. I had been asked if I could find some dancers who could respond as the felt led to a piece of live piano music based on Psalm 121: I Life my eyes up, to the Mountain. 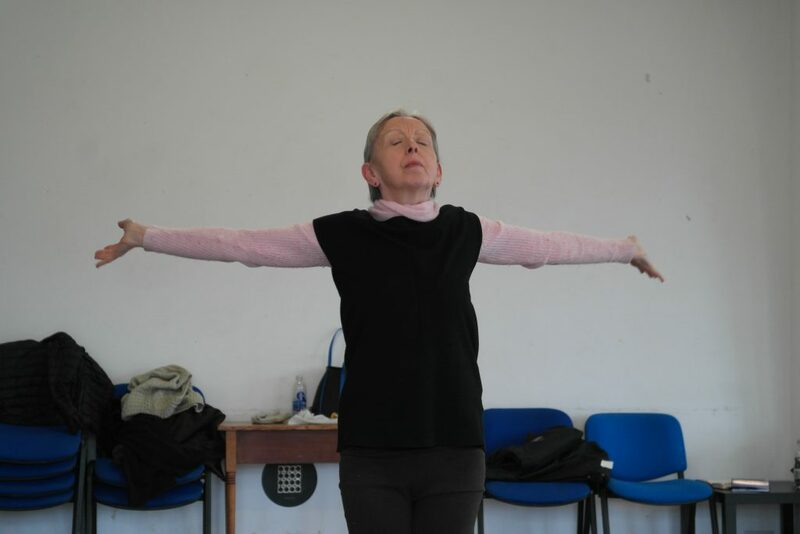 The lovely Helen Warren joined me as a second dancer, and our prayer before we danced was that we would reflect some of Jesus’ heart, that people would be drawn in with a desire to explore God more through our movement. Recently I recognised that I spend a lot of time teaching and delivering, and not so much time dancing for myself. Last night gave me the opportunity to come before God and thank him that I have the ability to move, but also reinforced that for UC Grace to grow, and share Gods heart, I need to make sure I am giving God mine, and that in turn requires time set aside for me to dance, and be lost in his love through movement. As the service progressed, Alwyn, the Vicar asked if we would dance again later in the service. By this point me and Helen felt we had ‘warmed up’, laid the foundations of showing Jesus through movement. So, as Jesus Christ, I think upon your sacrifice played, our hearts were stirred more by the spirit and we loved sharing more of that through dance and movement. 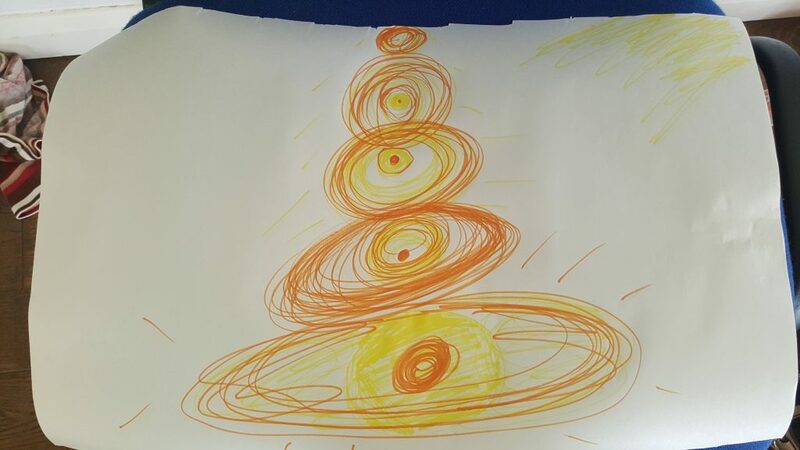 Much of the journey I have been on over the past week has encompassed the desire to draw back to the centre of what and why I do what I do with UC Grace. There were several things that God drew my attention to last night, it made me chuckle as the theme seemed to be everywhere I went at the moment. In my previous post I mentioned about the interaction between creativity and the heart, and that my desire when I started had always been that it was about the hearts impacted not the numbers. You can read more about it here. It is this theme of people’s hearts and prayer that keep cropping up. 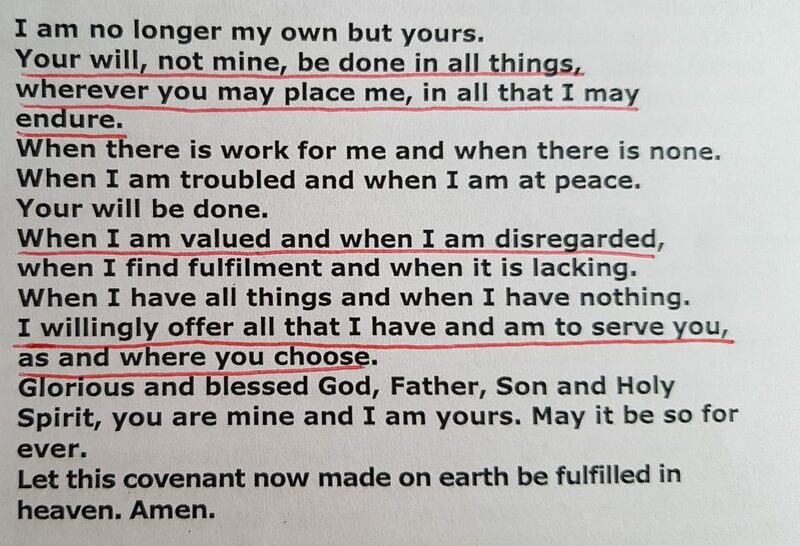 This prayer below reminded me that God places me where I need to be and with who I need to be, and I need to be willing to serve Him in what ever way that looks like. It’s really hard in reality isn’t it to keep that sense of doing what God wants and following his will. This chorus of ‘I the Lord of sea and sky’ (brilliant song, you can listen to here), sums it up very well. I will hold your people in my heart. The people that God puts in front of me at events, in conversations and through dancing. Each one is important. We did manage to video some of what we did last night. Not everything is in full view. But it will give you a flavour from our first dance. What special services have you danced in? Let me know. Keep up to date with the latest with UC Grace, by joining our mailing list here. The word creativity has been on my mind a lot recently, it’s taken me right back to why I started UC Grace, and how Living Colour dance workshops came about. I’ve been reading through previous notes and realising that at times it’s important to go back to your roots. The ultimate reason I began UC Grace in 2010 was a passion to share with others the impact that dance and movement can have with our faith, and how it can be instrumental in encouraging others in their walk, bringing others to faith, and teaching Gods word. I wanted to acknowledge that God has given us a creative spirit, to explore, move and grow with. To put ourselves outside the box. But as with so many things in life, distractions arise and before you know it, where you think you were, you no longer are. 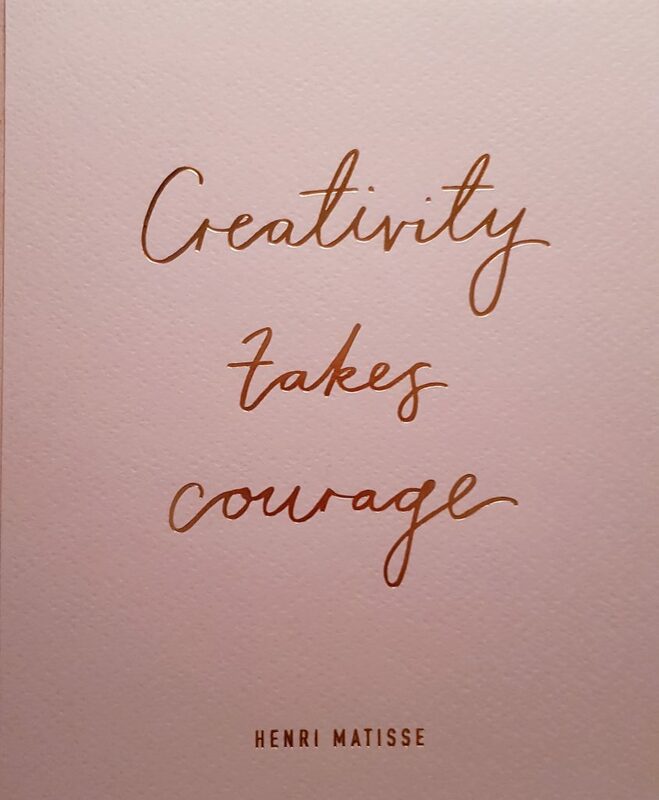 A dear friend gave me a card with the saying ‘Creativity takes Courage’. Initially I read it and put it to one side. Until last week, when I was drawn back to it, and the need to understand the implications of what that phrase means to me and to UC Grace. 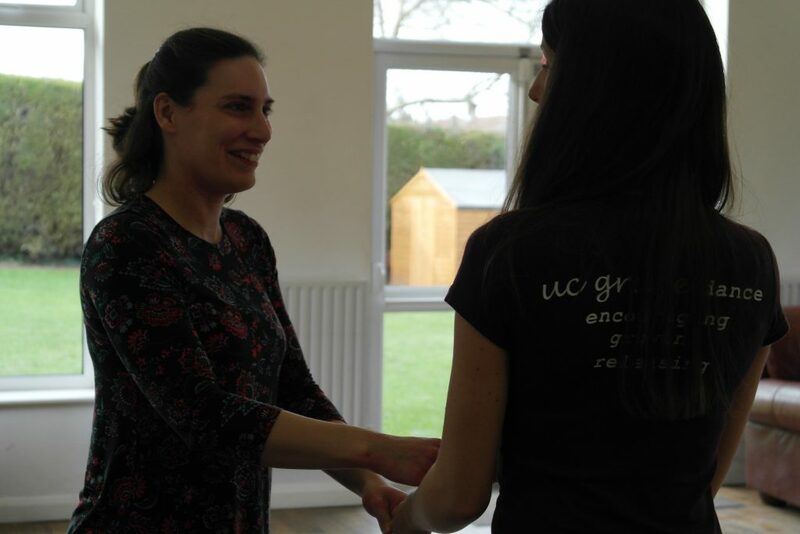 Creativity has been a fundamental part of how UC Grace has developed, it’s integral to how we deliver our workshops, training and dance weekends and is actively encouraged amongst participants to help them draw closer to God. However, I’ve felt challenged, that this fundamental root, the thing that shines through our work and sets it apart from others, has wilted. Don’t get me wrong, I’ve delivered all events with the same amount of gusto and passion, but had a feeling like something was missing, but not knowing what. As this year has got underway, the Holy Spirit has whispered in me more, and I’ve realised its creativity that’s missing. Or more specifically how I share the connection of dance and movement and our faith, by offering a creative channel within which to do it. Let me share for a moment what I mean by creativity with dance and movement and our faith! An aspect that we look at a lot, is our journey, how we’ve got there, and where we might be going to. 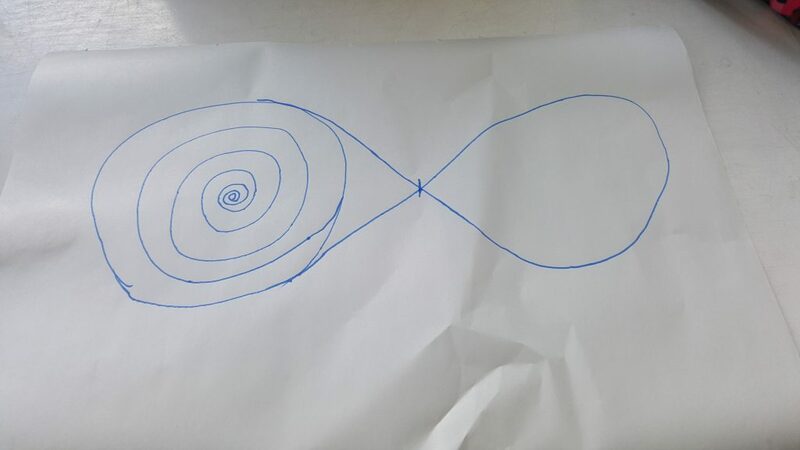 At one particular Living Colour session I asked participants to take a piece of paper and think about the journey that they had been on over the last week, and if they drew it, what would it look like? I then asked them at what points on that journey did they know that God was with them, and to mark it on the paper. From there their task was to transpose that picture into movement working individually initially, but then as a group. You can read more about how they did it, by reading the workshop plan here. But for now, look at the video below to see how they went from a picture to movement. So why does it take courage? It takes courage, because for a lot of people creativity is something they don’t experience in their day to day. It’s something that doesn’t have a written step by step process, or tick boxes. It’s something that draws us to discover something new about ourselves, by stepping out the box. The process is as important as the result is, both of which you might not have control over. Creativity takes courage, as it challenges your perceptions, your routine and your mindset. At UC Grace, that discovery happens in a safe environment, where whatever the result is, we support you as best as we can. Most importantly though, you join in as much or as little as you want. It’s never been about the numbers that come to events. It’s about the hearts. I believe that if you join us at our events, God has put you there for a reason, and I value that. The connection between creativity and people’s hearts is so important. Over the next month or so, I am looking forward to continuing to weave this strand, across the whole of UC Grace, some of what is on our website currently is not where UC Grace is now. As God moves each of us on in our journey, God also moves UC Grace, and I’m looking forward to delving into putting creativity right back at our heart, as well as revisiting our values and vision. We started with that phrase in 2010, let’s head back their in 2019 and see where it takes us. I’d love to know your thoughts and experiences, if you have danced and moved with UC Grace. But also, those that haven’t, how do you use creativity? What does it mean to you? So here is a simple workshop plan. Sometimes my plans are written out in detail, others are not as I know that there needed to be a lot of space to let God move and see where the session was going to take us. So below is an example of a ‘light’ plan. When I delivered this session, it was one of my busiest for a while, so it was lovely to see how each person developed their individual movement style. Pray – always begin with prayer, welcome God into the space you are in. Read all of Romans 8 – what are your initial thoughts? Verses 37 to the end. What has you week looked like? Where has the spirit been in it? Take a piece of paper and draw or sketch your journey. Think about peaks and troughs and how you travelled from one space to another. Individually – identify ways that you can put movements together to demonstrate your journey. Share with others if you comfortable. With Others – Link your journeys together. Do this by first all doing your own journey at the same time. Then identify points at which your journey can intersect with someone else’s. Finally, how different does the journey look if you add some one in? You should 3 variations now. Your own with others, your own that intersects with others and finally your own with someone else in the journey at some point too. Share with others your finished dance. Use it as a time of blessing, both to give, but also to receive. One thing I am passionate about is passing on the joy of moving and dancing with flags and ribbons to children. However, I am keen that they understand scriptural references and know that they are choosing to pick up a vehicle that can be used to talk to God, to communicate, worship and share their heart. But how does using dance and movement with children encourage them on their walk with God? From a wide-angle perspective dance encourages growth of self-esteem, beliefs, accomplishments and other skills, and releases children to live their life in a way that they want too and will be of value to them. 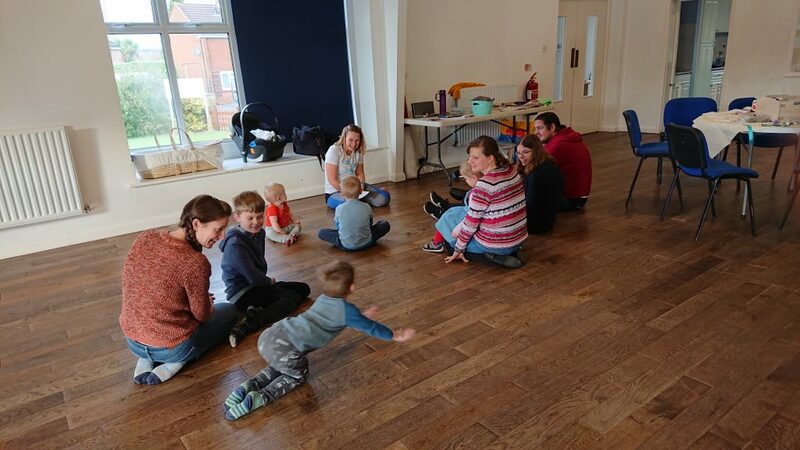 However, if you zoom in, dance and movement provide a safe space for children to learn to channel their emotions and communicate to God when words maybe difficult, it also provides opportunity for children to learn the Bible. Putting movement and actions to words, helping with memory verse remembrance and themes and topics in the Bible. Please recognise that you will have your own unique way of teaching – because God made you that way! So, what I put forward are simply suggestions, they are things that I have learnt along the way and have found helpful when teaching. There is too much to say all in this post, so make sure you check out my post about What the Bible says about Flags and Banners. 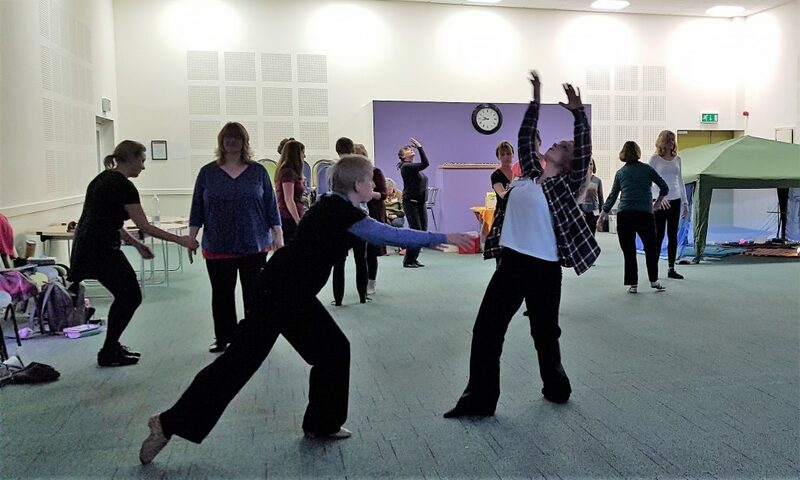 Information about a practical day to look at Teaching Children | Dance and Movement is available here. Here are my top 5 tips for teaching children flags and ribbons specifically. Boundaries – However well you know the children you will need clear boundaries in place. These include things like, the flag stays rolled whilst you’re teaching or talking. You put your hand up and count back from 5 when you want the children to be still. They sit down or put their flag down when you’re talking. You make it clear what happens if they continually don’t listen. They understand their dance space and where they can go when they move. Intentions – This is about letting parents and children know what they are going to be doing during the session. Depending on the context of your workshop or class, this is important. Although it might seem obvious, you will need to say they will be worshipping, praying, reading the Bible and dancing for Jesus. If it’s not a ‘normal’ event i.e. church, Sunday school etc. But more like a youth club, holiday club, you may have some unchurched children there (awesome), we just need to still be respectful of their back ground. No brainer with children! When ever you think you have enough you don’t! Regardless of how well behaved you think your children are, they will use a flag as a sword or poke someone on purpose. It’s new and exciting. Extra hands are also useful when you are teaching, as helpers can dot them selves amongst the children, so even if the children can’t see you, they can watch a helper (provided you’ve primed the helpers with what you are doing!). Should you split into group work, helpers can assist those groups and children that might be finding the task hard. It sounds quite harsh doesn’t it? But honestly, when you are teaching flags and ribbons you don’t want a packed hall. Not only will you have to fight above the noise to capture attention and teach safely. 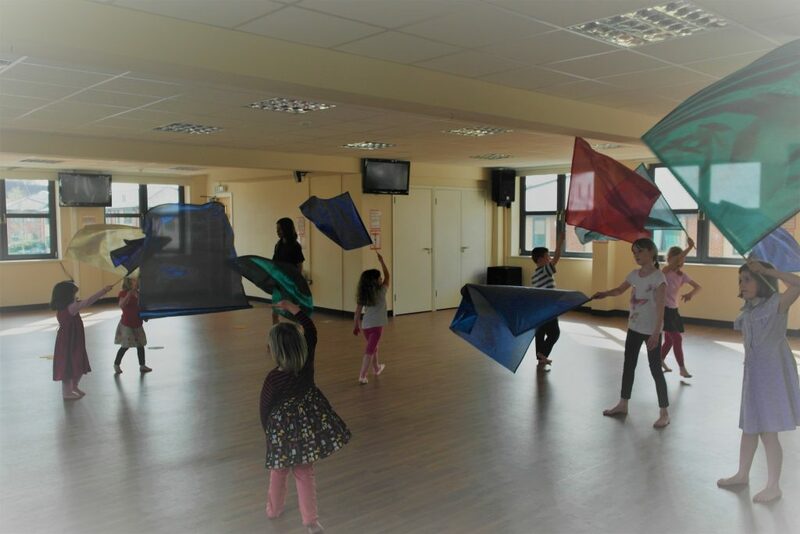 But the children won’t be able to enjoy the full effect of moving and dancing with a flag or ribbon if they don’t have the space within which to do it. If you do have to do a big group, my suggestion would be to split the group in two when ever it comes to actively moving as a smaller group can access the space more effectively. Repeat – constantly go back and re do what you have just done. All children learn differently, all children learn at different paces. Doing it as above, will allow children who learn differently to still be able to access what you are doing. 5. Pick one song and memory verse they know. With children, less is more. Don’t over plan. Pick something simple, that will allow them to be TAUGHT something and then allow them to CREATE something. That’s primarily why children love to dance and move with flags and ribbons. There is a freedom they don’t get in other activities. Let me know how you get on. There will be more hints and tips on teaching children and why we should invest in over the year. So, make sure you check back regularly. 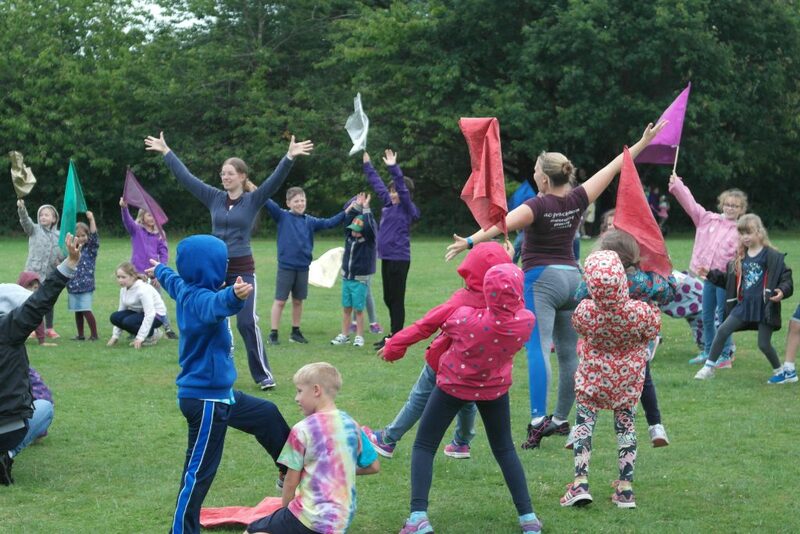 If you’ve got a heart to teach children but don’t feel you have the skills and confidence to move with flags and ribbons yourself, why not get in touch about running a Moving with Resources day at your church. You can get in touch with me here.